Easiest shrimp boil ever! And it’s mess-free using a single sheet pan. That’s right. ONE PAN. No newspapers. No bags. No clean-up! In a large pot of boiling salted water, cook potatoes until just tender and parboiled, about 10-13 minutes. Stir in corn during the last 5 minutes of cooking time; drain well. In a small bowl, combine butter, garlic and Old Bay Seasoning. 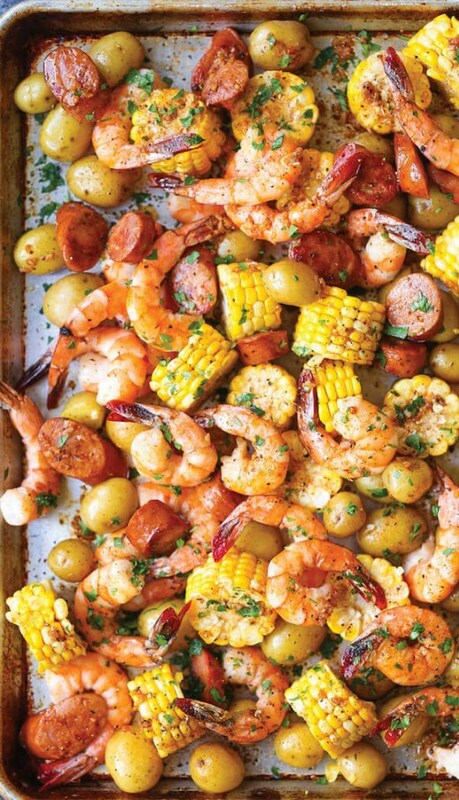 Place potatoes, corn, shrimp and sausage in a single layer onto the prepared baking sheet. Stir in butter mixture and gently toss to combine. Place into oven and bake for 12-15 minutes, or until the shrimp are opaque and corn is tender. Serve immediately with lemon wedges, garnished with parsley, if desired.